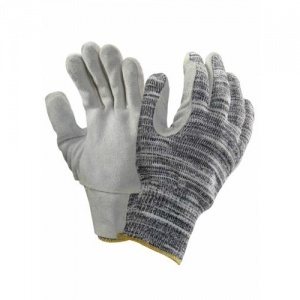 Knitted from high-performance fibres using advanced Technor Knitting Technology and reinforced with leather panels, the Marigold Industrial Comacier VHP Plus Cut-Resistant Knitted Gloves offer exceptional resistance to abrasion, cut, tear and puncture, and also promote superior grip when handling oily or greasy parts. As a result, these gloves are ideal for an array of manual handling applications, primarily in the automotive industry. The Marigold Industrial Comacier VHP Plus Gloves are knitted from high-performance fibres using Technor Knitting Technology. The result is gloves that provide exceptional resistance to abrasion, cut and tear, and are less likely to cause skin irritation due to their seamless design. Reinforced with leather on the palms, fingers and artery guards, the Comacier VHP Plus Gloves provide optimal protection against abrasion, cut, tear and puncture – achieving phenomenal results when tested to EN 388:2003 to determine their resistance to mechanical hazards. In addition, these leather panels promote superior grip when handling oily or greasy parts, making the gloves ideal for a variety of manual handling applications.